In August of 2010, just after the wellhead was capped, I joined The Sea Turtle Restoration Project’s Dr. Chris Pincetich, Captains Al Walker and Terry Palmisano, and Scott Porter of Ecorigs to see how much oil was still in Barataria Bay, in the Mississippi Delta. We found much more than we expected, with crude oil and sheen seemingly everywhere we checked. In one area we found a pod of dolphins poking their noses in the mud looking for morsels of food, only to kick up a nasty rainbow sheen of oil. And when they’d surface to breathe, their blowholes would open, sucking in that same oily sheen. It was the stuff of nightmares. When my respiratory problems became too hard to manage, I went to Florida to recuperate. The dolphins and other creatures of the Gulf were not so lucky. The situation was reported to the authorities, with whom I exchanged a number of frustrating emails. Finally a few months later, they went to the GPS Position I had provided and reported back that the dolphins’ health appeared to be normal. Frustrating for all sides involved I’m sure, and with the government’s gag order on NOAA staff due to pending lawsuits against BP, it’s been a long time with no news. My friends know how long I raged about the dolphins in Barataria Bay – and elsewhere in the Gulf where the mortality rates have been no less than astounding. Today that anger is back again, the memories of those dolphins are as vivid as if it were yesterday. In this video, you’ll see the dolphins around 1:13 forward. Dolphins in Barataria Bay off Louisiana, which was hit hard by the BP oil spill in 2010, are seriously ill, and their ailments are probably related to toxic substances in the petroleum, the National Oceanic and Atmospheric Administration suggested on Friday. As part of an ongoing assessment of damages caused by the three-month spill, which began with an explosion aboard the Deepwater Horizon rig, NOAA scientists performed comprehensive physicals last summer on 32 dolphins from the bay. They found problems like drastically low weight, low blood sugar and, in some cases, cancer of the liver and lungs. Yet the most common symptom among the dolphins, found in about half the group, was an abnormally low level of stress hormones like cortisol. Such hormones regulate many functions in the animal, including the immune system and responses to threats. Scientists said the dearth of hormones suggested that the animals were suffering from adrenal insufficiency. Lori Schwacke, the lead scientist for the health assessment, said the findings were preliminary and could not be conclusively linked to the oil spill at this point. 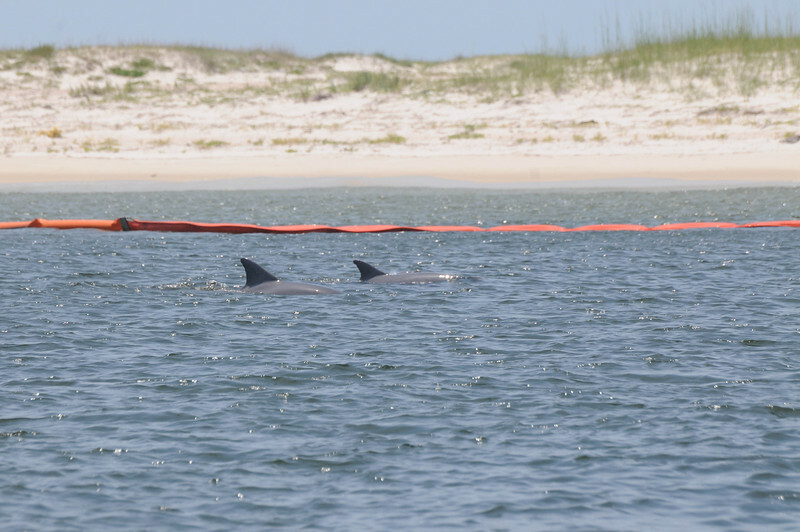 But she said the exams were also conducted on control groups of dolphins that live along the Atlantic coast and in other areas that were not affected by the 2010 spill and that those dolphins did not manifest those symptoms. “The findings we have are also consistent with other studies that have looked at the effects of oil exposure in other mammals,” Dr. Schwacke added, citing experimental studies of mink that were dosed with oil. Some of those minks developed adrenal insufficiency. 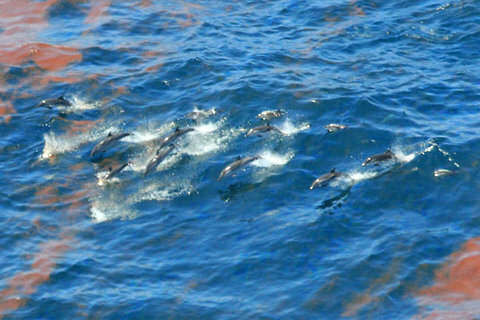 Strandings of dolphins began rising in states along the Gulf of Mexico in February 2010, or about two months before the oil spill. But NOAA says that the strandings have returned to normal rates along the Florida coast, which was the farthest from the spill, while remaining abnormally high along the coasts of Louisiana, Mississippi and Alabama. In Barataria Bay alone, with a population of about 1,000 dolphins, 180 strandings have been reported since February 2010. In a normal year, about 20 dolphin standings would be reported in all of Louisiana, the agency said. Ben Sherman, a NOAA spokesman, cautioned against drawing too broad a conclusion about dolphin deaths across the gulf from the findings. He said the results could provide “possible clues” to the effects of the oil spill on other dolphins in the northern Gulf of Mexico. “However, it is too soon to tell how the Barataria Bay findings apply,” he said.